They were all gone by '73, Ray. By then Paddy Sniff (Rev Patrick Walsh) was President (unfit for the job). The Dean was Fr. Michael 'Rubber Neck' Murray. Another toe-rag. Some of the classrooms at our school, Crumlin Road Convent faced some of the classrooms of St. Malachy's. You would have thought we had never seen boys in our lives the way we would be hanging out the windows and shouting after the boys. There's a conicidence. One of the contestants on last night's Australian version of Who Wants To be a Millionaire was Eugene McConville, who started St Malachy's in 1967 and emigrated in 1972 or thereabouts. stickyra, the nurses home was beside us as well and I am wondering if there were any of those windows in sight of St. Malachy's. Eugene McConville is my wife's cousin. How did he do on the show? Stiofan did you know a Paul Donnelly at St. Mals in the late 60's? Walter Larkin could have kept fish fresh. .. They just wanted us boys to grow up and be more wee priests. .might have worked if we had better examples to live up to! I was hopeless at Latin...so my opinion is a bit biased. Tink...that looks like the photo from the alumni site or do you have a private collection. I met Joe Houston in the middle of China last year and lived with him for a year. 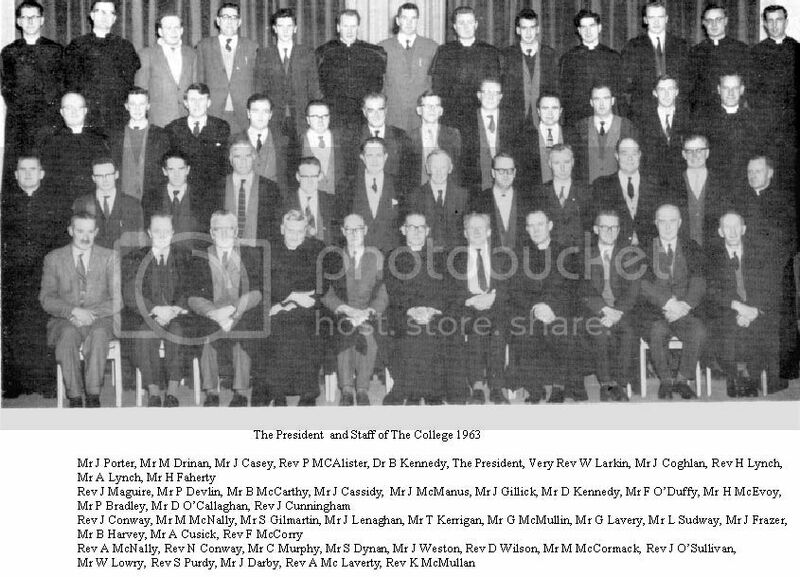 He was a couple of years ahead of us ...I am in contact with a small group via skype, Michael Clarke( Dessi), Patrick Mc Dade,( seamus) Ciaran Mc Namara,Barney Mc Laverty,( not yet) and several others. Joe and I CELEBRATED the 175th anniversary of the college IN THE MIDDLE OF CHINA by him saying Mass but we received no acknowledgement from the college. I enjoyed my stay as I came from St Patrick's in 1959. I remember Walter Larkin meeting Peter Doherty and myself . We had to get permission from him to be absent from college so that we could play basketball for Ireland . Peter was o.k. but Walter made me sweat whilst he decided. .but before we left he said that I could go.....whoo. What has happened to the Alumni site? It seemed to die off a few years back. Jim Holland was manager of the website and after his 3 yrs was completed he was let go but noone else was employed to keep the site up to date with news. Jim had a brother called Tim who was in my class. I sent an e-mail when I came back from China and a number of the Alumni objected to a dead site and there is a promise to catch up with comments from the address book and keep it up to date but I have not seen any movement yet.